Hoo Hoo – Who Am I? I love the new Two-Step Owl Punch! Here is a birthday card I made for a friend using the distressed Texturz Plate to give me a wood feeling. I used Taken with Teal, Peach Parfait and retired Close to Cocoa card stock along with a bit of Marina Mist 5/8” satin ribbon. 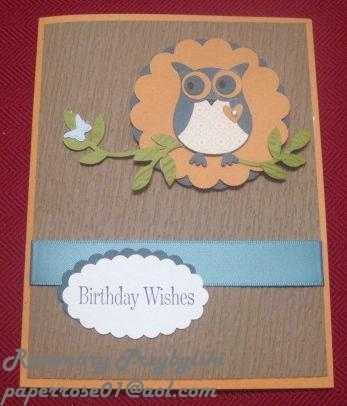 This next owl card is a sample of what we will be doing for our Punch-A-Bunch stamp camp on September 10th and 11th. Actually, this is the same format used for the owl card daughter Debbi and I did at Stampin’ Up Conventional earlier this month. I used the new Dotted Scallop Ribbon Border Punch, Wild Wasabi card stock and retired designer series paper. I added a tiny pearl to the Wild Wasabi arch image on the card insert. Another sample of the owl card we will be doing for September Punch-A-Bunch Stamp Camp. 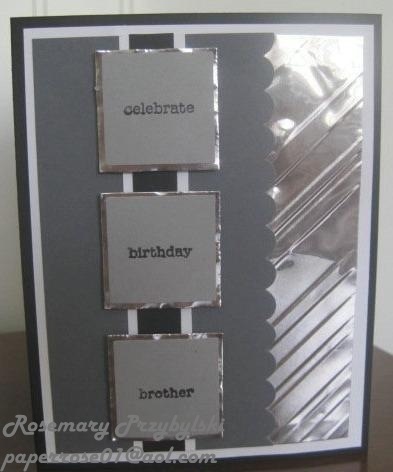 I used retired card stock – Ballet Blue and designer series paper. Note the tiny pearl earrings Miss Owl is wearing! The Two-Step Owl Punch is $16.95 and can be used for any season! 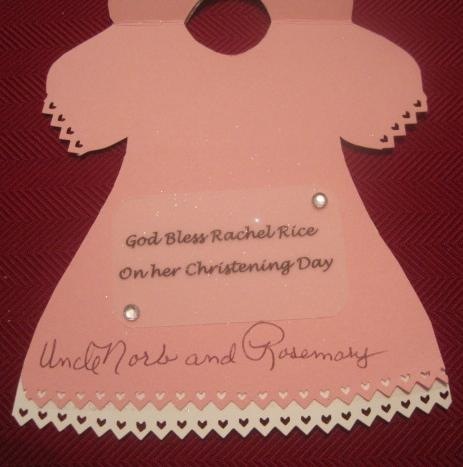 My husband’s niece recently had a baby girl and we were invited to the family Christening last weekend. 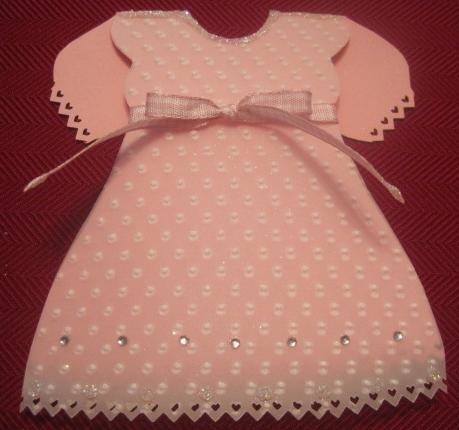 I had lent my baby stamps to a friend, so I couldn’t use my standard Christening dress stamp. 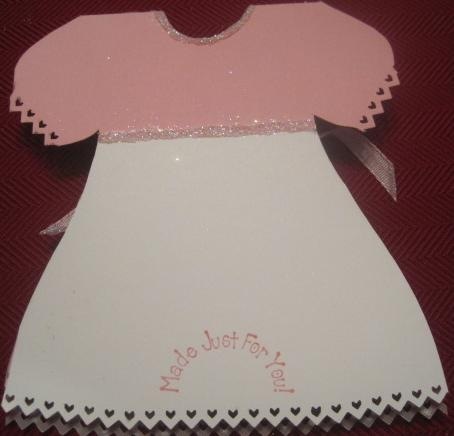 This is what I came up with using the Pinking Hearts Border Punch, Pretty in Pink card stock, Vellum, pink gingham ribbon and a few rhinestones. This was the first time I have tried a project such as this. This is the back of the card. I added a white skirt which, as you can see, is a bit crooked. I added a line of Dazzling Diamonds at the joining point. You’ll find FABULOUS DEALS on retired items such as Designer Paper, rub-ons, ribbon, and much, much more!!! Hydrangea – One of my favorites! 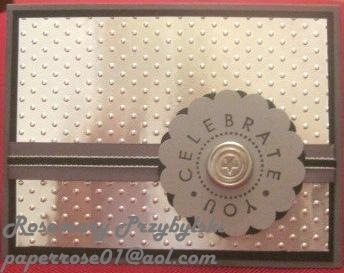 I absolutely love the “Because I Care” Stampin’ Up hostess stamp set found on page 11 in the 2010 Idea Book and Catalog. 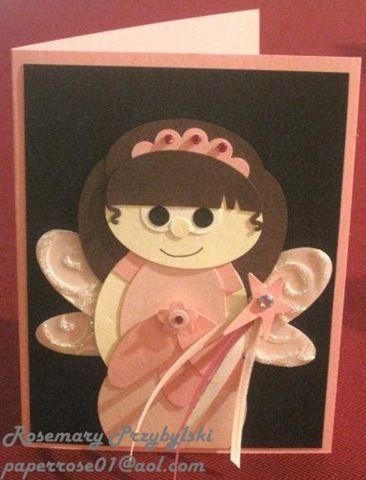 We used this stamp set for a home workshop in July and the crafters made the card and a matching bookmark. 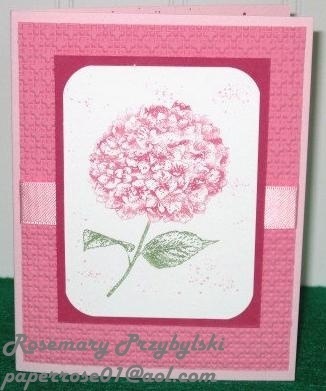 This card can be used for any occasion and is beautiful in shades of pink as I used here, as well as shades of blues and shades of lavender.